Wow, as a real beginner who is just playin' about with the sounds produced by a No1derland theremin (via a G1XNext 'Zoom' effects pedal box and Marsall amp) and making weird sounds over the last month I have to say I find all this in-depth talk fascinating if rather 'over-my-head'. I do love the sound a theremin produces and wave my hand about in kiddy-like joy, but can see this getting more serious. The 'other half' says when I go on about having some TT (Theremin Therapy as I call my time with it) that I should shut the door while playin' with my Meow Box. By that she means it sounds like a strangled cat!!! Nice encouragement eh? Keep up the discussions please. It all adds to the background knowledge that helps us 'outsiders' maybe progress. I can see a Etherwave STD or Plus becoming a family member soon............... hopefully! PS. By the way Amethyste, Gordon C directed me to view some of your playing. Life is now different!!!!! Thanks. I machined a mount that lets me put my Kustom on a camera tripod. The old beast is well balanced, but quite heavy, so I chose not to use a mic stand. You want to go to Lydia Kavina's next class! Yes you do! - They are usually in Oxford, and are, well, inspiring is too small a word.. If you are just starting to 'bite' I think Lydia will manage to get you completely hooked - and you will be a slave to the theremin thereafter! I am suffering severe withdrawl symptoms from not being able to attend these sessions for more than a year - I hope to get to the next one, whenever that happens. Fred. Right up your technical street this. Well I have been experimenting with aerial lengths etc lately to see what effect it has on the operating field 'depth'. Well I have certainly changed its 'field area' (probably not the right words.........) so I can get a larger area to operate in. Makes it easier to identify 'notes' as before my unit was very short range and a miniscule movement produced massive pitch changes. Just enjoying the experimental sounds right now !!! I have no idea about the theremin you are using.. particularly, whether it has an antenna inductance to linearize its response. From what you say, I expect that it doesnt. 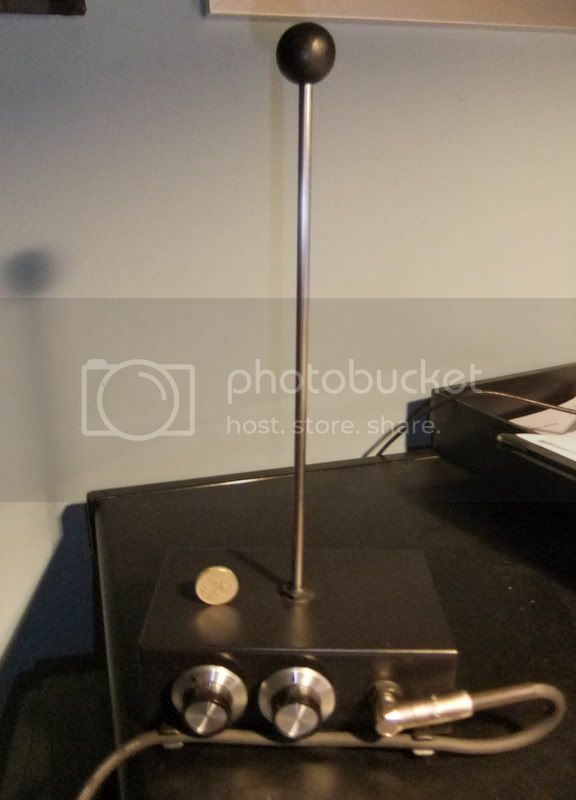 Just play about - I suggest making the antenna about 1.2m long and probably a bit thinner than what you have at present..
Well Fred, my 'toy' is this No1derland unit. Sorry about the rushed picture quality, but you get the idea. I have doubled the aerial length over the standard one which was a solid aluminium rod. The large wooden knob on the top of the new length aerial I 'robbed' from the original short one! This rod is stainless steel. Do materials have an effect? UK pound coin on top of case is for size reference only!!!! I heard a tale somewhere (not sure how true it is) That some thereminists were playing with a pitch antenna, and put an insulating sleeve or something like that over it - They all agreed that the tone quality (or something - I think it was tone quality) altered dramatically.. Apparently this was at some exhibit or whatever, and Bob Moog was nearbye - when he was asked about this effect, he apparently said it couldnt happen.. 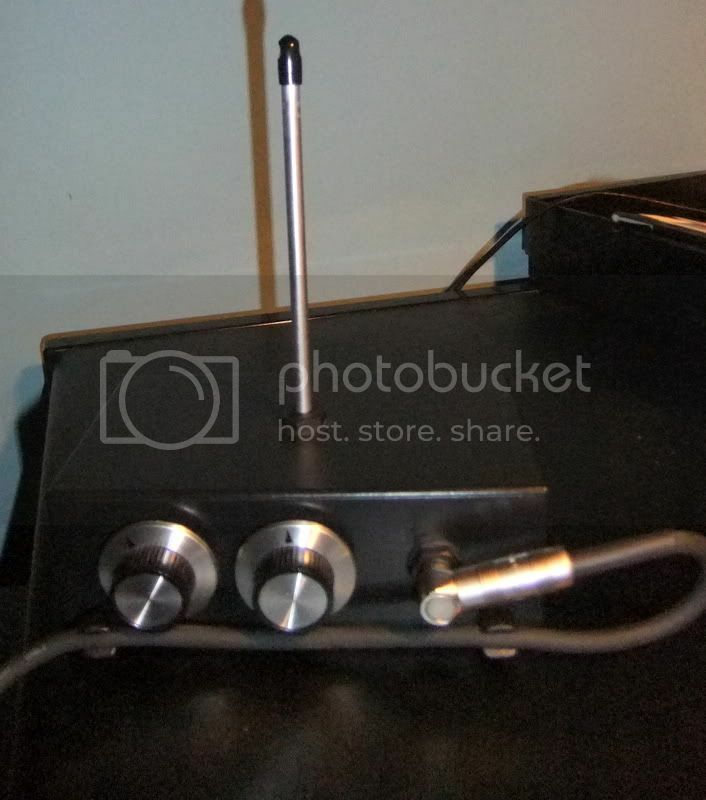 But no - I see no reason why the antenna material (provided its metal and not latinum or radioactive) should affect the theremin or the player. - With one other proviso.. Some metals have a greater thermal expansion than others - expand the antenna area, and you increase the capacitive coupling.. so this can contribute to thermal 'drift' I think, but unless one has extreme temperature change (I noticed drift on one of my H1 theremins when a spotlight was beaming onto its aluminium+steel antenna, which was getting quite hot, as it was covered in black sleeving) I doubt that it is of great significance. >> Just looking at those numbers, and doing some sums - I dont think thermal expansion of the antenna caused the drift on my H1, even with aluminium.. So I wonder if the heat radiating from the antenna possibly altered the dielectric properties of the surrounding air... Or, perhaps the spotlight was expanding! Oh yes; a very POSITIVE way. Made me more keen to explore these devices; so really, thanks!!! Keep up the boring kind please. Gordon waving knives around was different I thought. My better half thought that it was a sign he'd driven himself mad with 'that noise' and was about to 'top' himself. LOL. Sigh. She doesn't share my enthusiasm for the device. She says it must all be in the fact that the device gives off 'Theremones' (her play on the word pheremones as in having a desirable effect). "Oh yes; a very POSITIVE way. Made me more keen to explore these devices; so really, thanks!!! Keep up the boring kind please."